Japanese Prime Minister Shinzo Abe and his wife had their dinner with Israeli Prime Minister Benjamin Netanyahu and his wife interrupted by an offensive cultural faux pas — dessert was served in a shoe. Shoes are "despised" in Japanese culture, and it's a weird idea in any case to serve food out of a shoe. A Japanese diplomat called it offensive and questioned what the meal, prepared by an Israeli celebrity chef, was trying to accomplish. While serving food out of a shoe seems like an odd choice for any culture, it has a special and offensive connotation in Japan. 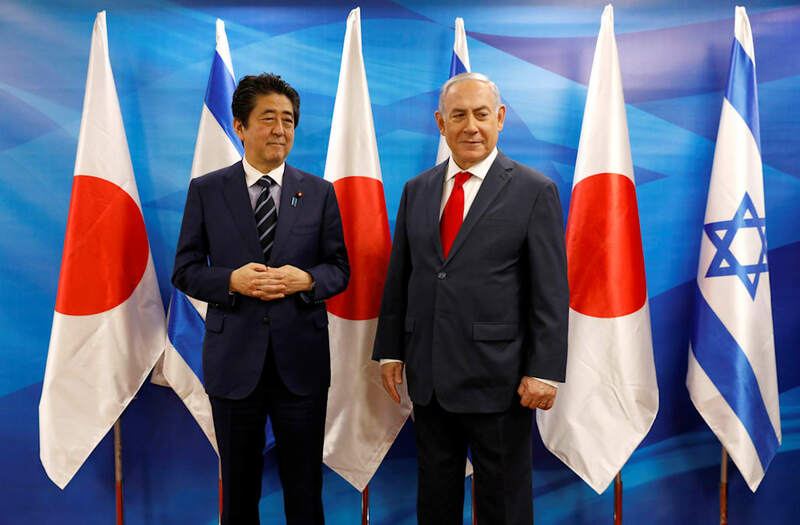 "This was a stupid and insensitive decision," a senior Israeli diplomat who served in Japan told Hebrew-language Yediot Aharonot, according to JPost. "There is nothing more despised in Japanese culture than shoes. Not only do they not enter their houses while wearing shoes, you will not find shoes in their offices either. Even the prime minister, ministers and members of parliament do not wear shoes to work... It is equivalent to serving a Jewish guest chocolates in a dish shaped like a pig," the diplomat said. It's unclear what message Israeli celebrity chef Sergev Moshe was trying to send by serving the chocolates out of a shoe, but it caused an uproar. President John F. Kennedy shows off some of the gifts, a beaded tie and a doll, that were presented to him today during a visit to the White House by members of the National Congress of American Indians. The Chief Executive, an honorary member of several Indian tribes, called for greater national efforts to provide better living for American Indians. Members of the United States Senate and House of Representatives present President Kennedy with a pair of cuff links after he signed his first bill as president. The congressmen present are: (from left to right) Rep. Fred Cchewengel, Rep. Peter Mack Jr., Sen. Everett Dirksen, Sen. Vance Hartke, Rep. Winfield K. Denton, Sen. John Sherman Cooper, William B. Brasy, and Sen. Paul H. Douglas. (Original Caption) This is a close-up of the 8 month old Russian puppy on the left that arrived at the White House as a gift from Soviet premier Khrushchev to President Kennedy. The puppy, an offspring of Stelka, the Soviet space dog is for Mrs. Kennedy. Here, the puppy is introduced to Charley, the Kennedy's Welsh Terrier. The puppy's Russian passport, is in the foreground. (Original Caption) Two rival political figures, apparently the best of friends, arrive by Transatlantic Airliner. Both the donkey and elephant are destined for Republican homes. The donkey, the animal adopted by the Democrats as their symbol, is a gift to David Eisenhower, the President's grandson, from the Spanish Foreign Minister. The elephant was imported from Siam for use in the Republican national campaign. (Original Caption) Pacific Palisades, California: Presidential-elect Ronald Reagan has his hands full as a white horse, a gift from the President of Mexico, Jose Lopez Portillo, rears as it is presented to him at a park near his home. The horse, Alamain, is from Portillo's private stable. January 12, 1981. King Abdullah of Saudi Arabia (2nd L) presents a gift to U.S. President George W. Bush in New York, November 13, 2008. REUTERS/Saudi Press Agency/Handout (UNITED STATES). FOR EDITORIAL USE ONLY. NOT FOR SALE FOR MARKETING OR ADVERTISING CAMPAIGNS. "No culture puts shoes on the table," a Japanese diplomat told the Hebrew website. "What precisely was this illustrious chef Segev thinking? If this is meant to be humor, we do not find it funny. I can tell you that we are offended for our prime minister," said the diplomat. The Times of Israel quotes a source close to the celebrity chef who is also an author and TV personality as saying the shoes were actually a metal sculpture.